Amazon just unveiled Dash, a handheld Wi-Fi magic wand thingy that helps you keep your AmazonFresh shopping list forever up to date. Never run out of toilet paper or oatmeal again! The handheld Dash device, about the size of a Nintendo Wii remote, packs a barcode scanner and a microphone, allowing you to scan or say what you're running low on without having to leave your kitchen. Necessities are automatically added to your Amazon or AmazonFresh account, so long as it's an item the wand recognizes and Amazon offers. Sounds easy—though judging by Amazon's Dash page you'll still need to confirm payment and delivery schedule from a browser of some sort. And then, like magic, your groceries, toiletries, or whatever, get delivered to your door the next day, according to the little girl in the promotional video. Sounds pretty convenient—as long as you live in Southern California, San Francisco, or Seattle, the only three areas currently served by AmazonFresh. 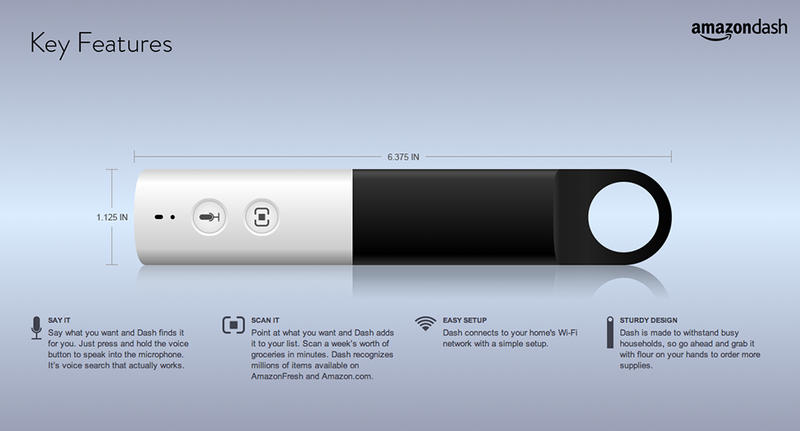 Right now, sign-ups for Amazon Dash are by invite only. If you're lucky enough to know someone who knows someone, you can try to sign up here.